On a sunny Thursday afternoon, Chris Ahn stops in front of University of B.C.’s Asian Centre. His fingers intertwine in front of his slightly bowed body, as he prays for his upcoming finals. The bell hangs from the ceiling of a traditional Japanese-style tower. It looks like a Buddhist pagoda. 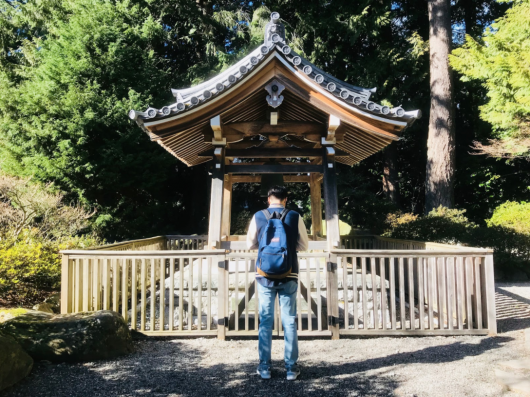 His mother, born and raised in South Korea, told him that praying in front of these pagoda-like structures can bring good luck. Ahn is not Buddhist, and his belief is limited to praying before his exams and, to some degree, meditation. Like him, there are many others who are not followers of the faith, but regularly carry out certain Buddhist practices. According to Statistics Canada, the Buddhist population in B.C. peaked in the 1990s, when the figure stood at 22,945. The number by the 2011 census had decreased by 28 per cent to 16,440. These figures take all kinds of Buddhism into account. But, as experts explain, it is hard to classify Buddhists. While some people choose to accept Buddhist prayer, and ceremonies like tonsure — shaving hair as a sign of Buddhist devotion — others might only follow some Buddhist practices and not consider themselves Buddhist on official records. “One thing that affects the data is that, do people claim to be affiliated with a temple or claim to be Buddhist in their religion? Statistics Canada often only records self-attested identity or specific links with a Buddhist organization,” said Jessica Main, UBC professor in Buddhism. Buddhism originated in the fifth century B.C. in present-day India, but soon spread to different parts of Asia. Today, it is the sixth-largest religion in the world. However, Buddhism does not have a wide presence in Canada. Today, it is only practiced by slightly more than one per cent of Canadians. “Buddhism is a minority religion here. They don’t have large resources like Christianity,” said Main. The decrease in Buddhist population comes despite the fact that Vancouver’s population is increasing, and many immigrants are coming in from predominantly Buddhist countries. Experts on Buddhism believe the lack of outreach and deep understanding of different Buddhist practices are the main reasons behind the population decline. “A lot of Buddhist outreach tends to be secular activities like meditation retreat, which is something that is very important in Buddhist thought, but it’s not often tied to a soteriological structure, or salvation path,” said Main. She says Buddhists do not explicitly urge people to convert but, instead, encourage people to try out some practices like meditation. This might be one reason why Buddhist missionary work does not often result in large number of conversions like other religions. Jing Le agrees. The PhD candidate in Buddhist folklore at UBC says Buddhists do not recruit in the same way as other religions. “Buddhists do not believe in the kind of outreach method that Christianity uses. They often believe in some form of enlightenment that one has to stumble upon,” said Le. In Buddhism, enlightenment is a desired state where one acquires transcendental knowledge about truth and life. This can be achieved through meditation. “For lay people who haven’t reached enlightenment, they can only understand elements of Buddhist teachings. They often do not feel comfortable identifying themselves as Buddhist,” said Le. Main also explains that some people choose to maintain Buddhist practices, but not associate themselves with the religion. “Some people would prefer to be disaffiliated from organized religion, which is a very common choice, maintaining a kind of Buddhist spirituality or private Buddhism,” she said. That is the case for Ahn. “I don’t feel comfortable calling myself Buddhist because I know Buddhism is much more than burning incenses and meditating,” he said. He prefers to be described as someone who only uses some forms of Buddhist practice. Chanting and Meditation: Not Buddhism? There are several commonly performed Buddhist practices. There is meditation, which is a state of clearing the mind and changing how it works. There is also chanting, which focuses on human betterment. But these two are different from Buddhist prayer, a rigorous Buddhist practice which involves systematic learning of the Dharma or teachings of Buddha. It is only practiced by devoted Buddhists. However, practicing meditation and chanting does not make one Buddhist. Some experts believe this could be a big reason behind the decreased Buddhist population. “A lot of people in Vancouver practice chanting and meditation, but without practicing Buddhist prayer, they would not be considered Buddhist,” said Le. Simon Fraser University Chinese religions professor Paul Crowe says that the worldwide popularity of Buddhist figures like the Dalai Lama and Thich Nhat is one reason for large groups of people to practice meditation. “Both of these Buddhist celebrities publish in English and avoid too much technical Buddhist language so the materials are accessible to a wide audience,” said Crowe. Zen Buddhist meditation is one such practice and a buzzing activity on the UBC campus. Zen Buddhist chaplain Gareth Sirotnik leads Zen meditations for UBC students twice a week. He says that many students try out Zen meditation to reduce stress, which is a big issue at UBC. There are still many Buddhism-related organizations in Vancouver. UBC is the host institution for the research project ‘From the Ground Up, Buddhism and East Asian Religions’. Through texts, artifacts and fieldwork, the project’s researchers aims to gain deeper understanding of Buddhism and other east Asian religions. Each month, the Dharma Drum Vancouver Centre in Richmond hosts meditation retreats of different lengths, for beginners and experienced meditators as well as Buddhist teachings. They also offer courses on Buddhist teachings, where participants learn about elements like the Buddhist Dharma and Bodhisattva precepts (moral codes used in Mahayana Buddhism). Such groups make it possible for people to choose how far they are willing to take their Buddhist practices; whether to accept is as a faith, or simply as a leisure activity.